Another new release from Resicast is their latest Tank Commander in Denims. This will be a welcome figure, as there are not that many British/Commonwealth tankers in denims around. This is a full figure made up of 4 separate parts, the main body, head and arms. Cast in a light gray resin, I could see no flaws in the casting, there is a hole in his neck but that will be covered by his head. A little clean up will be required around his boots to remove some flash, but a sharp X-acto blade is all you should need to remove the pour stubs. 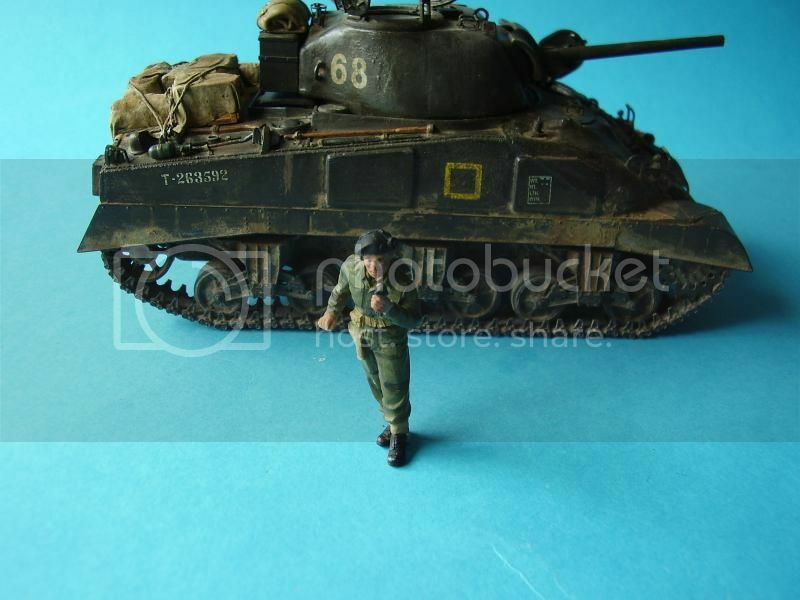 The figure represents a standing Tank Commander and is dressed in denims. Introduced in 1944, denims were often worn without or over the anklets. In this cast the legs are tucked into the anklets. It is a very good representation of the garment having the left breast pencil pocket with the correct number of holders, the plain right breast pocket and the two leg map pockets. The commanders 37 pattern holster sits over where the small top right leg pocket would be and the hip pocket is shown with a flap which is correct. Around the waist is a 37 pattern belt with the brasses evident both front and rear. As mentioned the figure wears a standard pistol holster hung from an ammo pouch on the RHS of the belt. Under the overall you can just make out the collar of the standard issue officers shirt/or DB as the case may be. The body has a good pose, being bent slightly forward at the waist and leaning to the left a little. The arms come as separate items, the right arm is extended and bent slightly, one would assume resting on the rim of the cupola of a tank and the left arm is bent upwards holding a radio mike. The head also comes as a separate item and is very good indeed. It shows the face of a mature man, with a moustache. 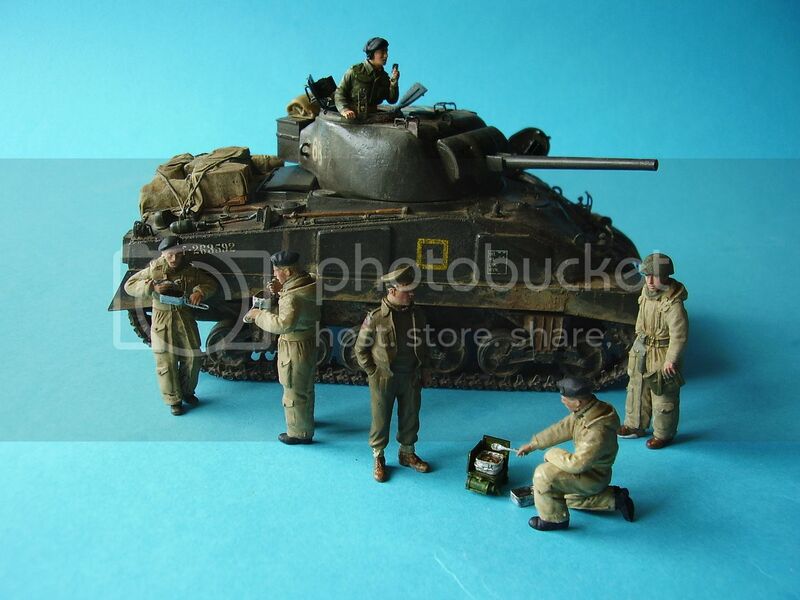 The facial detail is excellent and on the head is a standard tankers beret with badge. What is of additional interest is the set of headphones worn over the beret, the right hand earpiece is naturally enough over the right ear, but the left hand ear piece is resting above the ear. This is a much more natural way for the phones to be worn, at least I believe so particularly in this situation, one ear listening to the radio traffic and one tuned into what is going on around him. Normal safety precaution should be applied when working with resin. I really like this figure, the pose, the accuracy of the denim overalls and in particular the head. A very useable figure that should fit into most British tank cupolas. I tried the body in both a Churchill and Sherman and I don’t believe there would be any problems using this figure in either or the Cromwell for that matter. Excellent casting with 1st class detail, the figure should prove popular with both figure painters and Allied armour builders and will add a lot to any finished vehicle. Highs: 1st class casting and excellent detail. A much sought after order of dress with an excellent pose and interesting head. Great group photo, Al....nice to see all these guys painted up and in a 'setting'. Also shows how much 'life' figures can give to a vehicle, from static to vibrant.